We currently run our business out of three small and cramped rented rooms in a slum compound. In 2009 Poland East Africa Economic Foundation (PEAEF) provided seed funding for computers, internet infrastructure, and rental of KVC business location to launch income generating enterprise to sustain KSCYP operations. The location has enabled the project to expand its capacity that has led to more business and market creating more job opportunities to youth. In order to expand and accommodate more youth and vulnerable children, we are in the process of constructing an eco-friendly workshop and multipurpose facility. The new center is planned to serve up to 450 youth annually and will include an expanded space for KVC’s bag-making business and a facility to make hydra form bricks. In addition to the expanded workshops, features of the new facility include arbor-loo compost toilets, a shaded veranda for child feeding programs, self-manufactured bricks and roof tiles, and a children’s sanctuary. Also included on site will be locally made furniture, rainwater catchment and harvesting, a water well, and the sustainable farming of vegetables and bamboo. With help from international partners, the first phase of establishing the Kawangware Vision Center began by giving youth an opportunity to learn invaluable vocational skills through an eco-construction training program. Coursework in this program teaches the apprentices how to manufacture eco-bricks, tiles, and other construction materials onsite in Kawangware. The vocational skills that the youth learn enrich their lives and empower them to become self-sufficient; in addition, the training empowers the youth to manufacture the materials necessary to build their own facility. In today’s world, being computer literate is a must. Progressing globalization also in African countries creates various opportunities, which if properly taken, may influence the increase in the standard of live and quality of education. New computer and social skills gained during trainings raise individual’s competitiveness on the job market and reveal new educational possibilities through Internet. The key for better future are local people gathered in community organizations, often very small, who act actively to make changes in their life. The project included a series of professional computer trainings run in Kawangware and Kibera, directed to school kids, socially responsible youth and local community leaders. The main purpose of the trainings was development of IT skills. 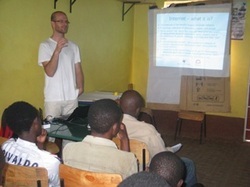 IT trainer, Karol Mitura, used creative and interactive methods to teach participants how to use computer and Internet programmes, fix IT equipment and design websites, but also to enable them to gain specific knowledge which they will use for academic, social or marketing purposes. KVC website was created within the Project as a result of Web Design Training. More than 70 people were involved in IT activities. The IT project was run by Poland – East Africa Economic Foundation (PEAEF) team and was co-financed by the Polish Aid Volunteering Programme 2010 of the Ministry of Foreign Affairs of the Republic of Poland. 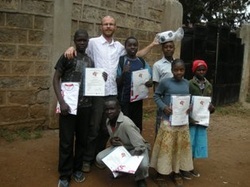 Project location: Kawangware and Kibera informal settlements, Nairobi, Kenya.